Scan Results 15 months post surgery. NDED vs NED? Re: Scan Results 15 months post surgery. NDED vs NED? Sorry to hear that and I understand why you are concerned. I am sure your oncologist will help you get to the bottom of it . What was your CEA leaves before surgery . We’re they only slightly elevated or higher ? I still think there is room for it being something unrelated but until it’s back down you will want it thoroughly checked out for your own peace of mind . Hi Stu, I agree it could be inflammation. I started diagnosis with CEA of 2.1. It didn't actually start elevating until around chemo treatment number 7. It jumped to 3.9 then to 4.5. I had inflammation issues the entire time during chemo and figured that was the reason. It could very well be this time as well with the esophagitis and diverticulitis inflammation along with the excessive exercise regime I've been doing. It's a huge downer none the less. After stopping chemo my levels dropped back down to 3 and had been sitting there at 3 and now this 4.6 is new high. While I did not speak with my oncologist directly today I did get a call back from his MA. She stated he had reviewed the level and thinks we should forego port removal and redraw blood levels in 3 months. I sent a big email into him after this call, since she could give me no further information. I have lots of questions and 3 months to sit on them seems ridiculous. 4/17/17 ULAR - Straight anastomosis - no ostomy. Path: low grade T3n1m0 - moderate diff. KRAS - NO, MLH1/PMS2/MSH6/MSH2 - Normal. 5/22 folfox - first treatment. I think that is their standard default position , time to let inflammation settle as well . What I don’t think they factor in is the anxiety that three months generates when the same information could be available sooner . Just my none medical opinion . My mum had a really susbstancial spread to her liver . Even to the non trained eye I could see she was in trouble , all her liver enzymes were entirely normal . However for years following treatment one enzyme stays raised . Could you speak to someone about anti inflammatory diet . My own body has some inflammation that comes and goes . I can tell when it comes . Given you are scanning well I would hold onto that just now . I did send a full page email with a laundry list of questions yesterday and received a call back from the triage nurse in the evening answering most of my questions reasonably. The nurse stated my oncologist was not concerned at all about the slightly elevated AST level. He also was not overly concerned about the CEA level given the clean scan, but thinks it warrants postponement of port removal until it drops back down. At my last follow up he mentioned not needing another CT scan for a year since this one was good. If the CEA levels don't drop I may maintain the 6 month protocol. At any rate I did get the triage nurse to move things at a faster pace. I will receive a blood draw Aug 30th, complete works with CEA. Then I will receive another draw and follow up with my oncologist in early October. So I'm more satisfied with the approach/course given now. I was told to continue my exercise regime as it would only help decrease my chances of recurrence. So today I resumed doing my 21 mile bike ride and made a personal best time of 78 minutes. Right around 16 mph average with some 20mph winds and 3 stop lights. So I'll hold onto the clean scan and very good energy levels and improving strength. That’s an incredible time you achieved . You are very fit indeed. I love hearing how people stay fit . You made me laugh at the “ laundry list” email . Does sound as though they think all is well . To be honest my husband is a doctor and never reacted to my mum’s raised liver enzyme. He though it was nothing to worry about so I followed his lead . I spent today sea kayaking with my sons. Despite being tiny I have managed to produce these really tall sons who are still willing to kayak with their mum . Sometimes with their gran who is seventy six now . It was a rewarding day as some seals played around the kayak . Right up the side. Does that count as fitness??? I mean it is Scotland with some wind and I did paddle a bit!! Well I Did a laundry list of things differently these past 30 days. I don't know if any of them contributed to the sharp decrease in CEA or it's just part of the normal fluctuation, but I shed 2 points from 4.6 to 2.6. This is the lowest reading in over 1 year for me. AST was back down to normal range too. Here is a graph of my CEA since diagnosis. Stu, I'd say that counts very much as exercise. Kayaking can be quite the work out rowing for a distance or against current. Aside from the physical exercise you were getting an equally if not more important exercise in the bonding with your family! It's quite fun to be accompanied by the friendly creatures too. I haven't experienced that so much with seals, but had a school of dolphins do something similar in Florida once. Very cool. Congrats to you on yourCEA decrease benben... that must be a big relief for you! Mine was up in the 6 range during chemo and it was back down to 2 with my first ct scan after treatment. My anxiety level waiting for results was through the roof as I understand it is for all of us through this whole process I’m very happy for you and wish you a wonderful weekend and many, many years of clear scans and normal numbers!! Whoop whoop . That’s fantastic news . So delighted to hear that . Love the graph . Lovely big dip downwards. ValZen wrote: Congrats to you on yourCEA decrease benben... that must be a big relief for you! Mine was up in the 6 range during chemo and it was back down to 2 with my first ct scan after treatment. My anxiety level waiting for results was through the roof as I understand it is for all of us through this whole process I’m very happy for you and wish you a wonderful weekend and many, many years of clear scans and normal numbers!! Yes mine started to spike during Chemo. I figured it was mostly just chemo related tissue damage and inflammation and it was slowly coming back down directly after chemo treatment ended the end of October of 2017. This recent spike though, I was 9 months out from last chemo treatment. Was figuring it be 3 or less given the trajectory. I don't know fully why there was a spike. I suppose it could have been an error in recording or in the reading. It could also have been the amount of inflammation throughout my body at the time - mostly due to excessive exercise and my lack of taking anti-acid medication. In the 3 months between the previous reading of 3.0 I had ridden bike about 800 miles and did a couple of arduous elevation climbs. Once up to colchuk lake in the enchantment wilderness area. Just 2 days before my CT-scan I hiked up South Sister Mt. in central Oregon. Over 5000 ft elevation gain, the first couple of miles with nearly a 50lb pack. The day before my scan I started to have a "flare" with lots of loose bowel movements. Then I consumed the contrast and it extended that flare for nearly a full week, during which my labs were drawn. So I had a lot of inflammation going on in my bowels/stomach and esophagus not to mention the healing muscle tissues from exercise. This last reading I stopped intensive exercise 6 days out and have been taking my omeprazole twice daily. Also stopped consumption of coffee, kombucha, and most anything else that could induce acidic reactions in the stomach. I certainly feel overall inflammation within my body was lower. 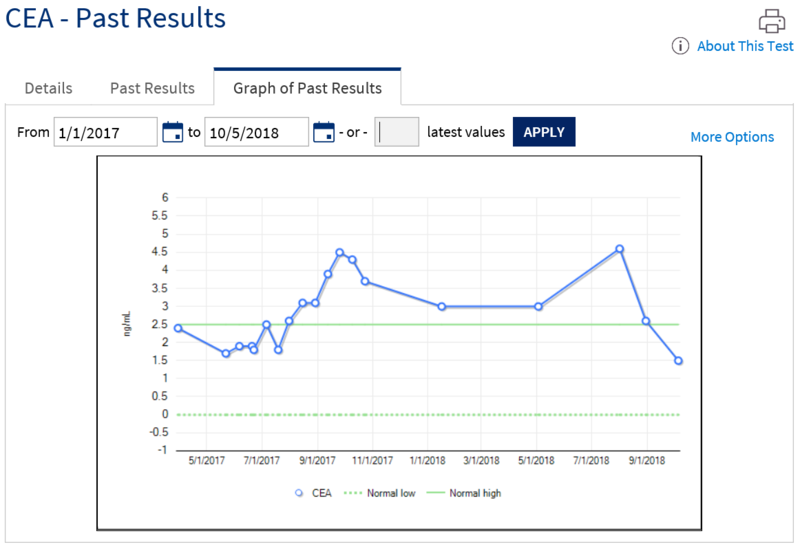 I'm happy to see the reduced CEA level, but it is still .1 above high normal. I hope to see it return to normal soon and I can resume with port removal. stu wrote: Whoop whoop . That’s fantastic news . So delighted to hear that . 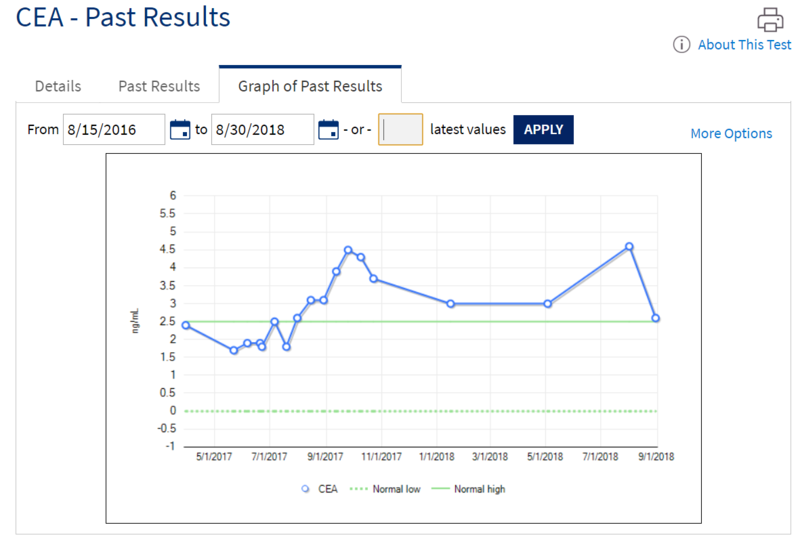 Well it looks like your CEA is on a downward trend now, so I'm hopeful you'll see even more than your hoped for .1 decrease next time and you can get that port out! That was some interesting information too about inflammation - thank you! I have my next CT scan and CEA test at the end of October and I'm going to watch exercise, caffeine, etc. as well. I find it's hard to stay "level" at times - focusing on the present instead of upcoming scans and tests. I know it means they're being thorough at least. Last edited by ValZen on Tue Oct 09, 2018 2:18 pm, edited 1 time in total. My lowest recorded CEA level - Ever! 1.5! Previous lowest was right after surgery with 1.7. So good today for labs, saw 2 of my favorite 3 nurses. My all time favorite drew my blood. She's a fellow cancer survivor (breast cancer). I told her about my CEA level conundrum and she told me She'd be crossing her fingers for me to have my lowest level ever and keeping me in her prayers. because the wounds were so large. Glad to see it didn't make a difference, or at least one that made a big impact. Yippee . Some great news for you . Thanks for sharing . It brightened my day .